Learn all the key terminology related to your engagement ring. Setting: The entire ring except for the center stone. The setting can also be referred to as the mounting, and this holds the center diamond in place and makes up the overall design of your engagement ring. In almost all circumstances, the term setting includes not only the metal it is made up of, but also any stones on the ring. Gallery: The area below the center-stone and above the shank of the ring. This is a great place to add some beautiful finishing touches to your ring. 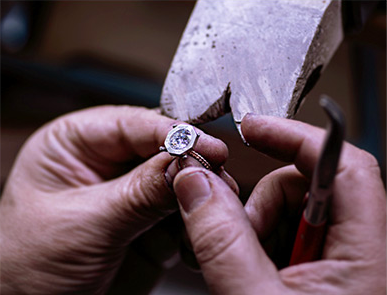 Stems: The portion of the ring that connects the halo or basket holding the diamond to the shank of the ring. On many Lauren B rings, we add pave diamond detailing to the stems to give your custom engagement ring. Halo: A frame of pave set diamonds that encases the top facing part of the center-stone. A halo increases surface area of the diamond when viewed from the top or aerial view and is a very popular style for many of our custom engagement rings. Seamless Halo: This is when the halo is custom made specifically for its center-stone resulting in no airspace between the two. Double Edge Halo: An extra edge of diamonds along the outer perimeter of a halo. This means your halo has two complete edges filled with diamonds on it. The double edge halo gives a sparkly look specifically from the side view but does not increase surface area of the diamond from the top. Double Halo: Adding a second halo to the top flat surface of the halo. This means double the amount of surface area on the ring. Basket: If the diamond is a fancy shape center such as an oval, cushion, pear, radiant, etc it can use an extra support system such as a basket. The basket is the metal connected to each of the prongs of the ring. Refers to non-halo designs only. Prongs: The metal tips/hooks that hold a diamond in a place. A traditional setting will have four or six prongs depending on the cut of the diamond and your style preference. These are an essential part of the ring and must be secure at all times. Claw Prongs: When the metal tips holding the diamond in place are made as thin as possible as to not take away from the beauty and overall look of the center-stone. These prongs taper in size from larger at the base to thinner at the top. Split-Claw Prongs: These prongs have tiny splits in them at the top. This can give an engagement ring a more classic appearance and a vintage feel. 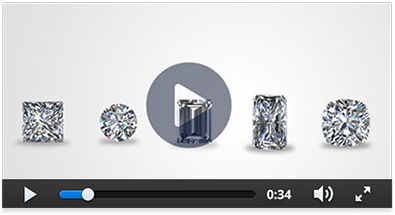 We see this most often with cut cornered fancy shape diamonds such as radiant, emerald or asscher cuts. The split can start right at the top near the girdle of the center-stone or it can be split throughout. V Prongs These are used to protect the points of sharp cornered diamonds namely princess cuts, pear shapes and marquise cuts. Button Prongs: These are straight prongs that are rounded on the ends and is considered a less desirable option for many. Pave set: Small diamonds or gemstones that are set close together in a line within the metal of the ring. The gems are separated and held in place by tiny bead prongs. The prongs holding the stones essentially disappear into the background of the ring giving the look of a continuous surface of diamonds. Micropave refers to small diamonds set under a microscope which is how most of our delicate rings are set. Shared Prong: Usually found in a diamond wedding band- this is when each diamond shares a prong with the neighboring diamond. Bright Cut: A thin wall of metal along both edges of the diamond and tiny beads in between each stone. This is a traditional pave style giving a very classic and sharp look. Channel Set: Not to be confused with bright cut, there are no tiny beads between each diamond and only the metal walls holding each stone in place. Fish-Tail: The extra hand metal etching of tiny "V's" next to each pave diamond that gives each stone a more distinct appearance and makes the metal reflect more light. Bezel: A small circle of metal that encases each diamond, usually in a circular shape. A bezel is like a halo but without any diamonds. The bezels are usually edged with milgrain to give it a more vintage appearance. Milgrain: A beading effect that also increases the surface area appearance of diamonds on a ring because it blends in with the faceting of the diamonds. Three Row Band or Triple Sided Band: when the band of the engagement ring has three rows of diamonds set in a domed formation. This style requires attention to detail and labor (three times as many stones to set) and results in a more dazzling effect. Pave Wrap or Scarf: This can also be considered an "under-halo" as pave diamonds wrap fully around going over the prongs and is another great way to detail your special engagement ring. Prong-to-Prong Wrap: When the diamonds go along the basket area but stop at each prong. A nice alternative to the full wrap, this style can also include diamonds going up the stems and along the prongs to give you a completely diamond encrusted gallery. Cathedral: When the band of the ring slopes up gracefully towards the halo or basket holding the diamond. A cathedral ring gives a more structured look and can feel more secure on the hand. Two-Tone: When a ring features two different metal colors. The most popular combination would be either rose gold with white, or yellow gold with white. The contrasting colors also allows your center-piece to stand out more. Floating Appearance: Refers to when the center-piece (either center-stone alone or center-stone and halo) appear as though they are suspended in thin air. This is achieved by having a four stem/prong attachment and a very delicate band. Low Profile: Relates to the overall height of the ring relative to your finger. Flush Fit: When your engagement ring and wedding band sit together on the hand without any gap between them. Many of our custom engagement ring designs are especially designed this way.